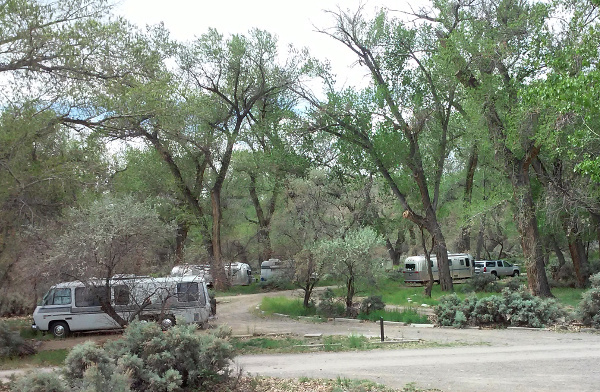 The SNU gathered at Fort Churchill Nevada State Park in April 2016. One of the visitors to the park was seen on the trail heading down to the river with his kayak. He said family was down at Lahontan State Park to give him a ride back to camp after he had floated down the Carson River. The State Parks Division has done a lot of work on trails and historical restoration at this civil war era fort and Pony Express station. Through Nevada, Highway 95 wanders around quite a bit, attaining a nearly north-south bearing only within four relatively short sections: 1) the Winnemucca to McDermitt section, 2) a section south of I-80, running from Trinity to Hawthorne, 3) the Tonopah to Lida Junction section, and 4) the section running from Boulder City to the California state line. Much of 95’s wanderings, especially those that occur between Hawthorne and Las Vegas, are caused by the highway’s attempt to stay within the state while being subjected to Nevada’s western diagonal border. To do that, the road keeps cutting east, then south, then east again, every now and then actually attaining near parallelism to the diagonal, while completing three major south-to-east curves. These curves are at Hawthorne, at Coaldale Junction, and at or just south of Beatty. The Silver Fox mentions Lucky Boy and Anchorite passes by description but doesn’t name them. She provides a good rundown on the route and provides some pictures to peruse. For more on this route, see our Destinations page Down the middle of Nevada on Highway 95 – The Bonanza Highway. Might you one day have a custom tour guide for your RV? A geologist decided it would be nice to share what he could see out the window on airplane flights. He built an app. John Farrier describes How a Geologist Designed the Perfect App for the Window Seat. Loeffler wants to develop the app further with augmented reality so that you can simply hold up your phone and Flyover Country will automatically display the geology of the area. You can get a bit of this with GPS devices and apps that show contour lines. For the RV tours, it would be nice to do this with a tour guide that would tell you what was coming into view and what was interesting or significant about it. There are some steps in this direction but it remains an open opportunity. There are also some efforts to link Wikipedia with mapping software that head in this direction. You can get an app that will show you constellations and stars when you hold it up to the sky at night. Some of the features that might be useful include offline caching such as Google Maps uses, being able to specify commentary focus such as geology, history, agriculture, architecture, local cultural lore, and others. You might also be able to choose a ‘sophistication’ level from ignorant tourist to topic expert to match the commentary to your needs and interests. The tour guide needs to be location and travel aware so it can comment and what is coming up in a timely manner, It needs to talk to you so as to minimize driving distractions. Tour books have been around for ages. A major benefit of touring is knowing what it is that you see. New technologies are raising the possibilities for investigating and learning about the places where you travel and visit. The ingredients are all there. Putting them together in a delicious recipe has some work to be done.